Why organic Coffee scrub donkey milk soap reduces Cellulite? Coffee is an important part of our everyday life. Its smell awakes very beautiful feelings for those who love it and many claim that until they have coffee in the morning they cannot work. But do you know that coffee has other uses besides waking us up? It is good for body and mind, both internally and externally. 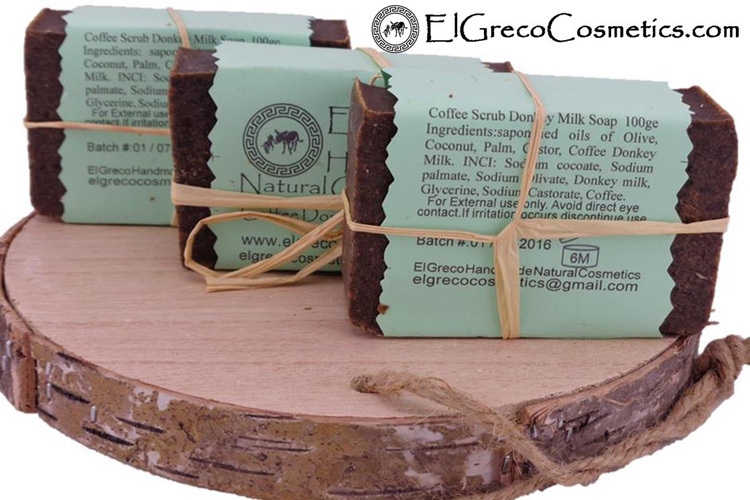 Organic Coffee scrub Donkey milk soap is organic donkey milk Anti-Cellulite soap and has many beneficial uses in bath and body products including toning skin, reducing redness, eliminating cellulite, and fading stretch marks and acne scars. Many people dislike the appearance of cellulite and prefer to have skin as smooth as they possibly can. Organic Coffee scrub Donkey milk soap is packed full of antioxidants which improve circulation to firm and brighten skin. With all of these benefits, it’s no wonder that our coffee & donkey milk exfoliating soap is my new favorite! Cellulite is the dimpled appearance of the skin that some people have on their hips, thighs, and buttocks. Cellulite is much more common in women than in men because of differences in the way fat, muscle, and connective tissue are distributed in men’s and women’s skin. The caffeine in Organic Coffee scrub Donkey milk soap is promoted as a treatment for cellulite because of its known ability to break down fat stores. Our Anti-Cellulite organic Coffee scrub Donkey milk soap is ready to treat your problem areas! Packed with donkey milk for improved elasticity and Rosemary Extract for firmer skin, you’ll see a reduction in cellulite and overall smoother skin. Donkey milk in this organic coffee scrub donkey milk soap combats the thickening of the skin brought on by age, allowing you to defy the laws of time. 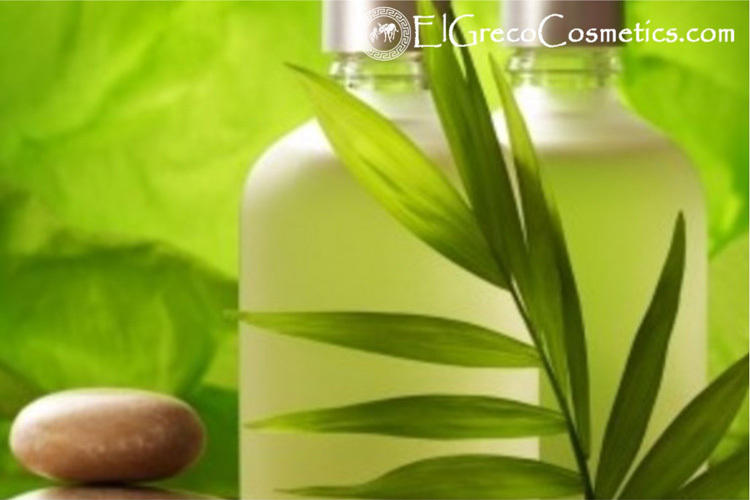 Olive oil and Palm Oil work to prevent and reduce the appearance of wrinkles for a healthy, youthful glow. Our organic coffee scrub donkey milk soap or honey donkey milk soap was created for the kitchen, but as with all organic donkey milk Anti-Cellulite soap, it also helps those suffering from skin problems. Organic donkey milk Anti-Cellulite soap is rich in vitamins, minerals and complex fatty acids that help to remove irritation moisturize and repair your skin. Coffee in our organic coffee scrub donkey milk soap is usually associated with helping to stimulate your senses in order to start the day however it can also perk up your skin. The caffeine in organic coffee scrub donkey milk soap has a number of benefits: Treating redness and inflammation; reducing the appearance of under-eye circles and gently eradicating cellulite. By incorporating caffeine, which is included in our organic coffee scrub donkey milk soap, into your skin care routine, you can reveal evenly toned, smooth skin. The coffee added to this organic donkey milk Anti-Cellulite soap is finely ground to provide a mild exfoliating action, but ground coffee also serves by removing odors from the skin, such as onion or garlic. Donkey milk in our organic coffee scrub donkey milk soap is added for its natural anti-oxidant and anti-microbial properties as well as its ability to draw moisture to the skin. After a long, taxing day, treat yourself to the finest form of relaxation. A warm bath paired with our organic coffee scrub donkey milk soap will melt away your stress while nourishing your skin. You’ll feel refreshed and ready to take on what comes next! Along the same vein of the scars, coconut oil smoothes and softens the skin, lessening the lumpy, uneven appearance of the cellulite. To use our organic coffee scrub donkey milk soap as Anti-Cellulite soap, simply massage a small amount into the affected area daily. 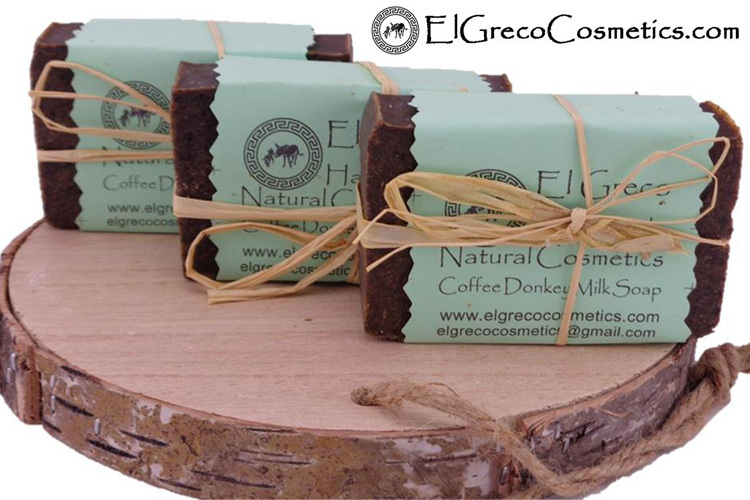 Our organic coffee scrub donkey milk soap is a super bar that is practical and will invigorate your body and mind. All our organic coffee scrub donkey milk soaps are made using whole donkey milk from the donkeys of our farm. Our organic coffee scrub donkey milk soaps they do not contain preservatives or chemicals. 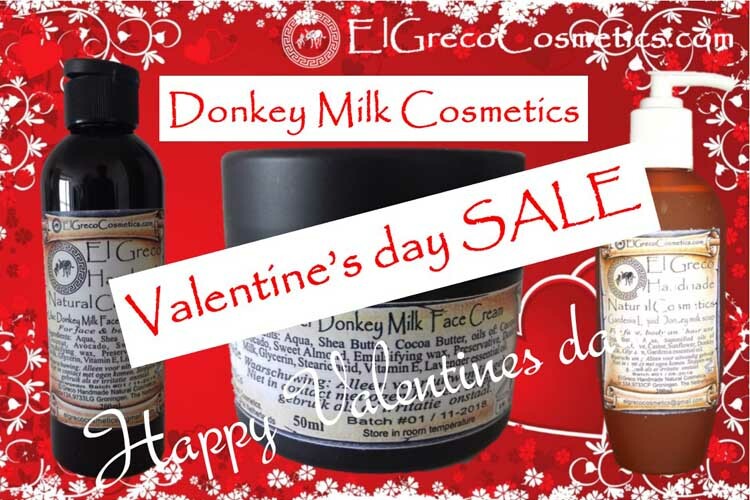 Why El Greco cosmetics organic coffee scrub donkey milk soap?